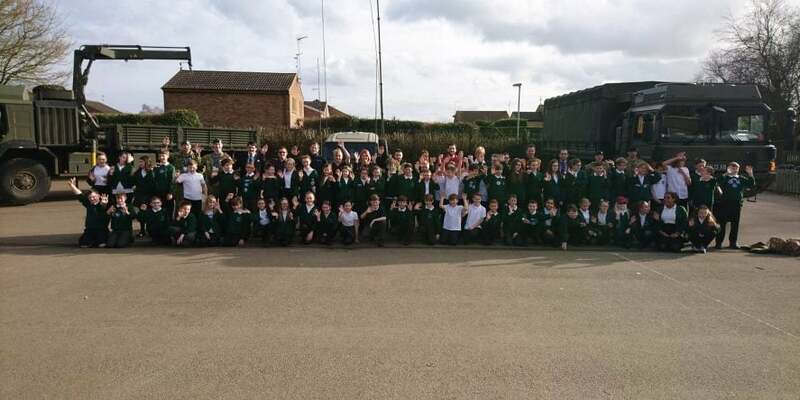 On Wednesday 1st March a group of 17 business professionals from Peterborough and Deeping went back to school, headed up by Hazel Cottrell of Creative Content Company for a Careers Awareness Day with the Year 6 children. Hazel was joined by the army, the RAF, a first aider, the police, a computer technician, an accountant, a bridal car company, a warehouse supervisor, an account office manager, a dog groomer, a prison worker, a boxer and the owner of a carpet shop to help the children of Linchfield Community Primary School learn more about their jobs and what they do. The professionals answered a wide range of questions including what hours and days they worked, and the skills they needed to do their job as well as what they wanted to be when they were younger and which celebrity would be best at their job. The children also got a chance to ask their own questions which included asking the policeman how many people he had arrested and the youngest person he had arrested, who inspired the professionals and who their role model is, and perhaps the strangest question – do the prisoners get to eat profiteroles! The army, RAF and police also bought their vehicles with them to give the children a chance to try on outfits, pretending they were driving the vehicles and, of course, trying out the sirens in the police van – before being locked in the back of the van.